There’s a certain queasy feeling that comes from bobbing up and down in three-foot waves while spray-skirted inside a sea kayak. It’s not quite seasickness, but it’s close enough to make you long–momentarily–for flatwater or, better yet, terra firma in the form of a wide beach and thatch-roofed cabanas. Luckily, all are in ample supply at Slickrock Adventures’ base camp on Long Caye, a skinny finger of dry land 35 miles off the coast of Belize. The Caribbean water is so clear you can anchor and find yourself snorkel-to-fish-eyes with moray eels in seconds. 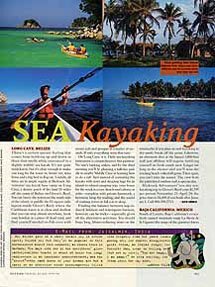 At Slickrock, sea-kayaking instruction is comprehensive but painless: No one’s barking orders, and by the second morning you can brave swells on the south side of the island or paddle straight out from the north side and into an 82-square-mile lagoon, inside Glover’s Reef. And instead of cramming the kayaks with tents and sleeping bags for an island-to-island expedition, your home is the castaway-style base camp, with a sand-floored dining hall, composting toilets, and conch-lined pathways weaving among the coconut palms. The two-person bungalows come outfitted with a hammock on the porch, a solar-powered lantern for reading, and the endless crash of waves to lull you to sleep. Finding a balance between nap-induced delirium and waterspots burnout, however, will be your greatest challenge. To fully understand the appeal of multisport adventure tours, remember this: More is definitely more. This wouldn’t be so withering if we hadn’t spent the past week of our vacation sailing in a torrential rainstorm, dodging charging cattle on mountain bikes, leaping off a 25-foot cliff into a raging river, rock-climbing without ropes, trekking up and down steep valleys, and eating — or trying to eat — Vegemite. None of this suffering impresses Jensen, however. “Power set!” he yelps. We dig in. Unfortunately, we catch the competition, which only inspires Jensen. “And another,” he cries. Finally, after the 37th stroke of the fifth power set, our sorry crew tumbles from the canoe onto the sand, damp and wheezing. We limp up the beach. And there, as if in a dream, we find paradise: a white-clothes table spread with boiled prawns, lemon-baked chickens, kangaroo filets, steamed vegetables, cheesecake, and glasses of 1994 Tatachilla Cabernet sauvignon. 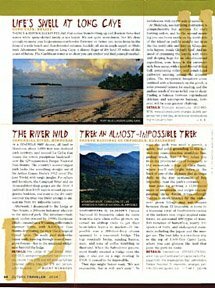 Such is the schizophrenic nature of the travel option know as the extreme multisport adventure, which combines kamikaze-type activities with more conventional luxuriating. Most even deign to call themselves vacations — which requires a rather elastic definition of the term. Although it may be enough for an organized “adventure” trip to provide bicycling or diving or climbing, billing as a multisport adventure requires, well a lotta sports. 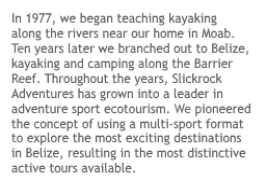 And, in an attempt to appeal to the AAA-type go-go-go personality, many of these multisport outfitters advertise their particular trips as the most strenuous or eclectic or adventurous ones available. Which guarantees that virtually every moment of a client’s vacation will be jammed with aerobic activity. Truth be told, such cardiovascular gymnastics may not appeal to everyone. fear not. despite brochure-speak describing full-on “adventures,” most of the newest multisport jaunts more closely resemble packaged cross-training — with chateaubriand and shiatsu thrown in. so dump the image of a week long bivouac with powdered eggs and freeze-dried tuna casserole. Accommodations on these trips are deluxe and meals copious. “People sometimes gain weight,” one outfitter admits. All of which makes multisport adventures a good choice for those vacation tweeners drawn neither to long, lazy sprawls on the beach nor to living out of a rucksack. A few days on my vacation in Australia lent a little insight into what makes for a successful multisport trip: Most important, it must be diverse. why pay someone money to send you on a ten-mile-long run, which you could manage easily enough on your own? What you need is an outfitter who can supply a kayak or a mountain bike, climbing ropes or an outrigger canoe. The best multisport trips include offbeat, interesting new activities, together with all necessary gear and instruction — and to my mind, a hot tub and resident masseuse. From the dozens of multisport offerings that met these criteria, we culled five of the most intriguing, including the Eco-Challenge. Each provides plenty of both scenery and sweat, a variety of aerobic activities, and swank dining and accommodation options. Those pleasures don’t come without hazards, however: spoonfuls of noxious Vegemite and high-intensity biking, for example, do not mix well. Trust me. So much for serious adventuring. 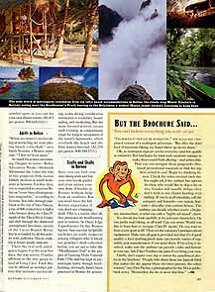 Despite its name — Belize Adventure Week — Slickrock Adventures Inc.’s nine-day tour of this gorgeous little nation blithely involves as much hedonism as heroism. 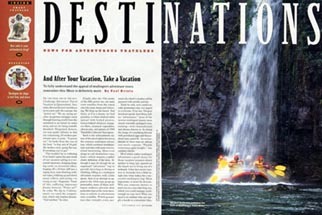 For four days, you’re expected to crisscross Belize on “every form of transportation imaginable,” according to Symons. You bike through rainforest to the top of Vaca Plateau, a rise of 600 vertical feet in half a mile; bounce along the Class IV rapids of the Macal River Gorge; and drift through the darkened underground limestone caverns of the Caves Branch River, one of the premier caves in Belize. You’re rewarded for all this activity with authentic Mayan cooking at luxury jungle outposts. Then the real self-indulgence begins. For the next five days, the trip moves 35 miles offshore to the tiny green island of Long Caye, one of the best beach resorts in Belize. Each day, you’re offered an aerobics palette that includes sea kayaking, Belize scuba certification, boardsailing, and snorkeling. But the most favored activity occurs each evening, as competitions erupt for longest occupation of the resort’s hammocks, which overlook the beach and the blue waters beyond. For information on this trip and a three-day tour that includes the ancient Mayans, contact Slickrock Adventures: (800) 390-5715. OK, so multisport trips are not for everyone (and few qualify as romantic). But brochures for most of such vacation s manage to make them sound both alluring — and achievable. How can you navigate these gorgeously illustrated promotional materials to find the trip best suited to you? Begin by thinking fitness. Check the miles covered each day. You might ask if the outfitter has options for those who would like to skip a day or two. Guides will usually oblige; they don’t wish to see clients keeling over midtrip. If you’re at all uncertain, call the company, and honestly — we repeat, honestly — describe your current fitness. The outfitter can decide whether you’re a beginner, intermediate, or what one calls a “highly advanced” client. You should also look carefully at the activities themselves. Do you prefer road biking, or off-road? Can you swim? would you like to learn how to navigate Class IV rapids? Do you want ot learn a new sport at all? Then vet the company’s promises about equipment. make sure all gear is provided and that it’s of a good quality; a local sporting-goods store can provide names of reputable gear manufacturers if you need them. If bicycling is involved, make sure the outfitter can provide a bike and helmet in your size. Ask if they’ll reduce the price if you bring your own.